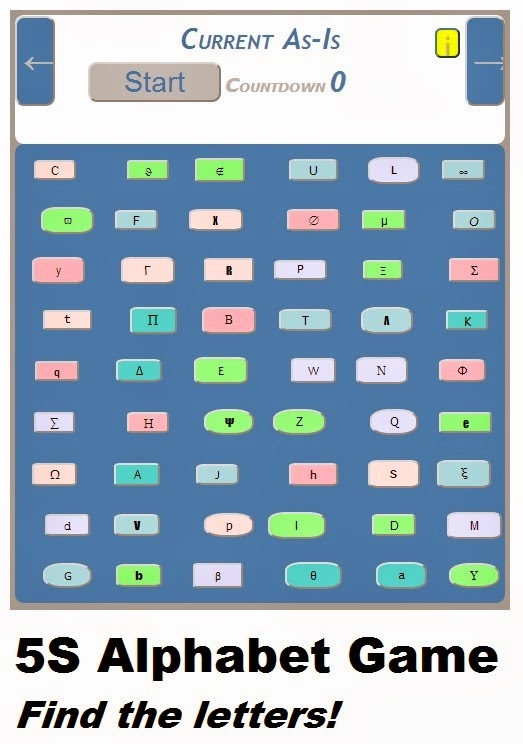 Lean Simulations: The 5S Alphabet Game - How fast can you click? The 5S Alphabet Game - How fast can you click? The 5S Alphabet Game - Online Version! Learn basic 5S concepts using this on-line 5S simulator. If any of you have used the 5S Numbers Game for training (find it here), you'll recognize the basic idea! This is basically an on-line version of the 5S Numbers Game, only with letters! Thanks to a comment on the 5S Numbers game page by Mo De (sorry it took so long to respond! ), I was led to this blog, 5salphabetgame.blogspot.ca, where you can find the alphabet version in all it's on-line glory. Press "Start", then click on the letters in alphabetical order, starting with A and going all the way to Z. as fast as you can! You can only click on the capital letters and they're all jumbled up and mixed with a bunch of small letters and symbols. And, since we all could use a little more stress in our lives, there's a convenient countdown timer ready to shut the whole thing down before you can finish! How does finding jumbled letters on a page teach 5S concepts? Just like the 5S Numbers Game, the Alphabet Game works in phases. Start with the jumbled letters, and see how many you can get. The letters are "Sorted" and all extra small letters and symbols are removed. Now it gets a little easier. The next step finds the letters "Set in Order" and in zones. Once again easier. Finally, the letters are laid out in alphabetical order ("Standardized") for easy clicking. Following proper 5S rules makes it easy to click letters on the Internet! After the clicking tests, the 5S game ups the ante, with a "Find the Defect" test. Some letters are removed and you have to figure out which ones. Once again, the jumble reappears. Good luck finding the missing letters until they are all sorted! Is the 5S Alphabet Game worthwhile? Apart from playing around with the game myself, I'm having a hard time figuring out how to use it in a training setting. Most 5S training is done out on the factory floor, or in a lunch or boardroom. But perhaps if you have people sitting at a bank of computers it might make sense. Or you could choose a victim to perform in front of the class? Like all lean games, you cannot just make your group play the game. It needs a good facilitator to explain what 5S is all about, what the game is demonstrating and how it relates to their daily activities. You need to ask some pointed questions and get some engagement! Check it out. It's an interesting diversion and you can challenge your friends to see how many letters they can get in each phase! 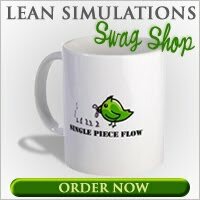 I've added this to my list of free lean games and simulations. I'm not very good at this game. The every day payback rate won't be higher than 10% of day by day net deals, the day by day rate depends on the month to month charge cards deals volume and the measure of loan required. The "Sage Not Responding" issue in Sage 50 Peachtree Accounting programming document and the goals requires propelled learning of PC's working framework. USA & CANADA Toll Free No. 1800-270-1896 Sage Not Responding Should you require more help, call us 1+800 (270) 1896 on our sage to address our master specialists.